On 31.05.2009 in the "Dan Kolov" hall - Sevlievo took place the Republican Championship in Karate Shinkyokushin for senior boys and girls. It was a very strong competiton, due to the fact that many of the competitors in the youth National team took part in the event and the audience watched many close and attractive fights, most of which ended in vazaari or ipon. The fighters of SK "Kyokushin" - Shumen made an excellent performance by winning two gold medals and one silver. In the girls 55kg category Djanet Dimitrova became the republican champion, in her semifinal she convincinlgy defeated her taller opponent Atanaska Merdjanova from "Trakia" - Plovdiv and in her final she was paired with another competitor from Plovdiv. The young karateka from Shumen won in regular time with a very well placed jodan mawashi geri /a kick to the side of the head/, which brought her vazaari. Another title for Shumen's club was won by Zahar Kichuk in the 75kg. category, who in his semifinal knocked his opponent from Petrich out with mawashi ski and in his final defeated a representetive of "Trakia" - Plovdiv. Iordan Georgiev was awarded a silver medal in the 55kg. category, losing his final to the much more experienced Neno Angelov from "Tornado" - Pazardjik, the bronze medalist of this year's European Championship. During the current 2009 up to this moment the competitors of SK "Kyokushin" - Shumen have 9 republican champions - the highest number in the club's history, 4 vice-republican champions and 4 bronze medalists on Republican competitions. Training sessions in karate Kyokushin are held every day from 19:00 to 21:00 in the outer gym hall of PMG "Nancho Popovich". On 16.05.2009 in the "Sikonko" hall - Sofia took place the Republican Championship in Karate Kyokushin for men and women in kumite and kata. 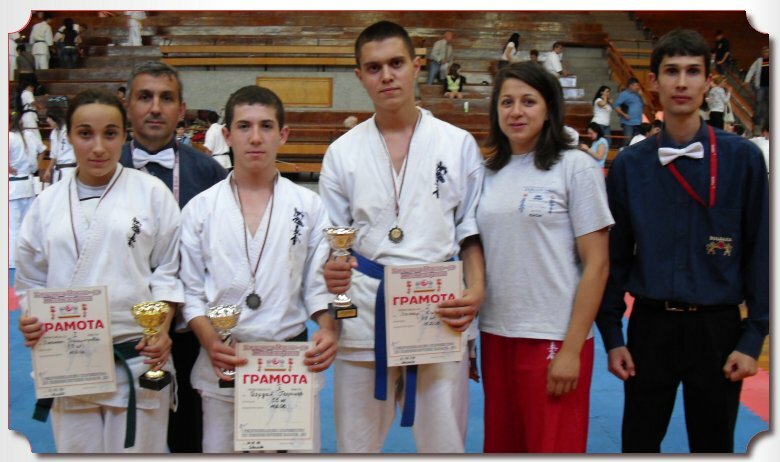 The competition had excellent organization, provided by the hosts of Kyokushin Karate Club "Kanku-Kai" - Sofia. Some of the strongest competitors of FBKK couldn't take part in the event, due to the unsuitable time in which the championship was held - right after the European Championship and before the World cup. Despite this the audience was able to watch many close matches, most of which ended in vazaari and ipon. Some of the competitors of the youth National team showed a strong performance, not only did they fight on the same level as the men, they also surpass them. This is a good factor for their future in the men National team. SK "Kyokushin" - Shumen's team also showed a strong presence, which this year was composed of veterans only. In the men Kata event the chairman of the club Stoian Obretenov took second place and in Kumite Aidan Ahmed, Nikolai Davidkov and Shaban Shaban defended with dignity our city's honor, although they did not take home awards. The next week for the first time in Shumen was hosted the Regional Championship in Karate Shinkyokushin. The competition was held with the assistance of the Municipality of Shumen and young karatekas from Shumen, Veliki Preslav, Kaspichan, Tzarev Brod and Russe measured their strength in 16 categories for children of 8, 10, 12, 14 years of age. Our goal is to make the Regional competiton traditional and to help make Karate Kyokushin popular amongst the youth, as well as help the selection for SK "Kyokushin" - Shumen's teams. For many of the children this was their debut on the tatami of a competition and is a stage of preparation for the upcoming Zone championship in all age groups, which will take place in early June in Novi Pazar. 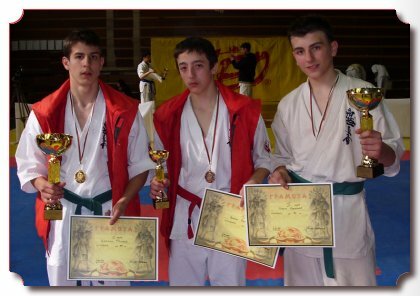 On 25.04.2009 in the "Mladost" hall, Shumen was held the Republican Karate Shinkyokushin championship for junior boys and girls. In the competition took part the karatekas of 14 clubs from the whole country. The competitors of SK "Kyokushin" - Shumen made an excellent performance, winning one bronze and two gold medals. In the 55kg. category the national competitor Bogomil Tiholov was on a level above his opponents and accordingly became the republican champion for the sixth time in a row. On the quarterfinal he easily beat a fighter from Sevlievo, in the semifinal he defeated his opponent from Goce Delchev and in the final fight he won in regular time against Andrei Rusev from Nesebar. In the 70kg. category Georgi Iordanov brought us great joy, who in his semifinal pairing, after brilliant tactical fighting, defeated a strong opponent from Pazardzik and fought a great final with Damian Vishanov from Russe, both of them have met many times on the tatami. The match was incredibly difficult, because both competitors knew each other well, but in the end the young karateka from Shumen was able to beat his opponent in the last extra-time. In the 50kg. category a bronze medal was earned by Vanio Valchanov, for whom this was the first competition in junior age categories. A good debut was made by Osman Osman in the 55kg. category, who is in training from several months in the branch of SK "Kyokushin" - Shumen in Tzarev Brod, under the leadership of Aidan Ahmed. The Republican championship was organized with the help of Municipality Shumen, sports centre "Fabilus" and the IKON firm. The preparation for the competitors of the club continues as the Republican championship for men and women is near. The tournament will be held on 16.05.2009 in Sofia. Training sessions in karate Kyokushin are held every day from 19:00 to 21:00 in the outer gym hall of PMG "Nancho Popovich".